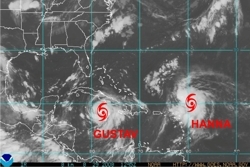 Satellite imagery of Gustav and Hanna. Today, on the three year anniversary of Hurricane Katrina, preparations are underway along the Gulf Coast for the possibility that Tropical Storm Gustav will strike the region next week. At 3:00am MDT Friday Gustav had tropical storm strength sustained winds of 65mph extending out 140 miles however it is fully expected to become a hurricane today. It possibly could increase in intensity to a category four storm with 130mph winds by the time it makes landfall toward the beginng of next week. Gustav's current predicted track as of Friday morning. It goes without saying that the storm presents a serious threat to life and property with landfall expected late Monday or early Tuesday. The greatest danger lies between Houston, TX and Mobile, AL but anywhere along the Gulf Coast remains at risk for a hit from the storm. State, federal and local officials are preparing for the worst as they should. Disaster declarations have been issued by Louisiana Governor Bobby Jindal and Texas Governor Rick Perry. Mississippi Governor Haley Barbour has declared a state of emergency. New Orleans Mayor Ray Nagin is expected to issue an evacuation order for the city, but it likely would not go into effect until Saturday. Hanna's current predicted track as of Friday morning. Tropical Storm Hanna, while less of a threat for the United States, also bears watching. Hanna currently has winds of 50mph and should remain near those levels today but it is expected to become a hurricane in the coming days. The storm this morning was located about 245 miles north-northeast of the northern Leeward Islands. Hanna’s track at this point is uncertain. A system currently over the Great Lakes could force Hanna to turn to the northeast thus missing any major land features. This entry was posted on Friday, August 29th, 2008 at 7:44am MDT and is filed under National Weather, Natural Disasters. You can follow any responses to this entry through the RSS 2.0 feed. You can skip to the end and leave a response. Pinging is currently not allowed.